Keep lunch and snacks perfectly chilled in this freezable ice cooler bag that does the job without needing any extra ice packs. 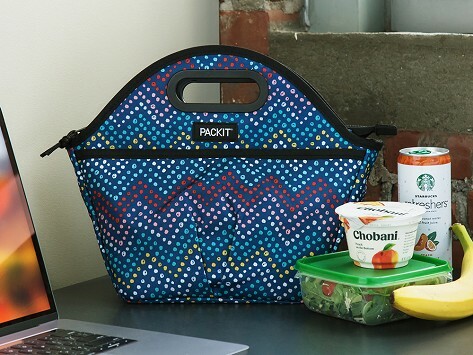 Freezable gel liner built into the fold-flat walls of the tote bag means it can go from the freezer to the office or cafeteria and keep food and drinks cool for hours. A wide bottom adds stability and fits large containers, and an exterior pocket is the perfect spot for cutlery and napkins. Haven't had a chance to use in the summer, but for now is great. My daughter is a rural route mail carrier and this is for her.